3.5.Who is affected, in what ways and to what extent? The initiative is foreseen for adoption in 2014. The lead DG is DG ENTR. DG SANCO, DG TRADE, DG ENV, SG and the LS are associated in the process. by using 5% of the new toxicological reference value for lead as the basis for new limit values (instead of 10%). To support the preparation and drafting of the earlier impact assessment, a Commission inter-service steering group (IASG) was established. DG TRADE, DG SANCO, DG ENV and SG participated. The IASG met 3 times. The Commission informed all concerned stakeholders (Member States, industry, consumer protection associations, standardisation bodies, Notified Bodies (NBs)) on its initiative during the meeting of the Expert Group on Toy Safety in April 2011; several Member States supported the revision of the limit values for lead. Some preferred to do so based on a Tolerable Daily Intake (TDI) allocation of 5%, another referred to a TDI allocation of 10% coupled with an exception or with a transitional period. The Expert Group did not object to the use of a TDI allocation of 10%. One Member State called for an impact assessment to be performed. Subsequently, a number of Member States expressed support for Option 3 b) (5% allocation and exemption for the Arts and Crafts toys) examined further below. Following this, the Commission received position papers from the toy industry (Annexes V and VI), indicating that the Commission's initiative would have important impacts on the sector's competitiveness. The main impact highlighted by industry was its incapacity to continue marketing certain categories of toys. Taking this into account, the Commission further consulted the toy sector via a targeted public consultation 1 . The targeted group of stakeholders received information on the initiative and was invited to express their opinion on the identified problems, options and other relevant issues. The consultation was published on the "Your voice in Europe" portal, as well as on the DG ENTR webpage dedicated to toy safety and ran from 13 February 2012 to 07 May 2012. Additionally, business associations were informed about the consultation via email and were asked to circulate the information amongst their members. The results of the consultation were eventually published and business associations were duly informed about their publication. The Commission also collected position papers from consumer protection associations, in particular from ANEC 2 and BEUC 3 (Annex VII). ANEC and BEUC support the revision of the limit values for lead in toys, in order to increase as much as possible children's protection against lead exposure and related health consequences. All toy materials would contain lead at the level of the applicable migration limit values 8 . However, new data available from market surveillance monitoring exercises in Germany 9 , 10 in 2010 and 2011, and from a limited market surveillance action in Sweden 11 , suggest that most of the toy materials contain only very low levels of lead, with few exceptions. the revised limit values should be calculated starting from 10% of the new toxicological reference value for lead, namely the BMDL01 relating to neuro-developmental effects. However, the Toy Safety Directive 2009/48/EC sets the allocation of the toxicological reference value for lead (and five further metallic elements or compounds, namely arsenic, cadmium, chromium-VI, mercury, organic tin) strictly at 5%, due to them being considered particularly toxic as referred to in recital 22 of the Directive. sets the allocation at 5% of the BMDL01. 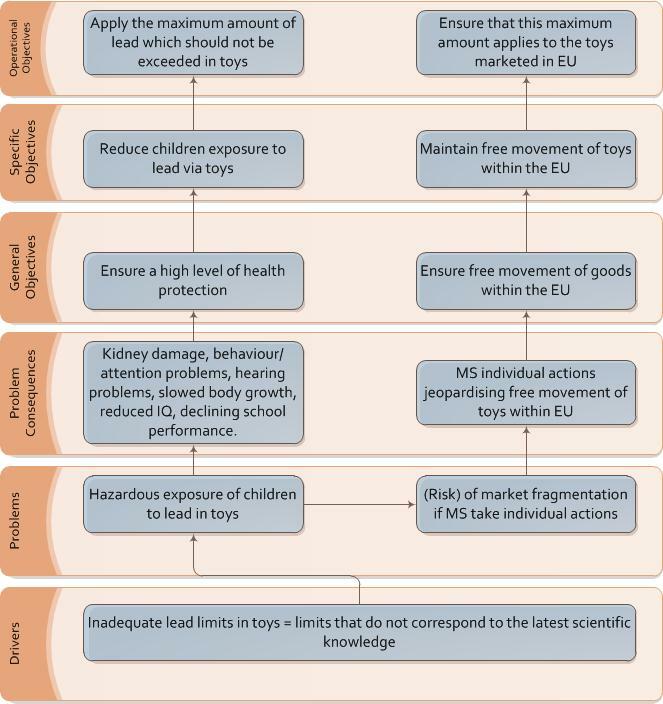 The above two elements and their impact for the establishment of new limit values for lead in toy materials were discussed with all stakeholders at the meeting of the Expert Group on Toy Safety in May 2014. A range of Member States preferred a 5% allocation of the toxicological reference value, while others favoured 10%. Stakeholders from the toy industry and consumer representatives were equally split in their views. The Impact Assessment Board of the European Commission assessed a draft version of the earlier impact assessment and issued its opinion on 16 January 2013. The Impact Assessment Board made several recommendations and, in the light of the latter, the revised earlier impact assessment clarifies the regulatory framework and provides additional background on lead exposure sources. It also enhances the baseline scenario. Additional clarifications were also made as regards several tables and figures, and calculation assumptions used. Some of the arguments used to discard certain options were clarified. Building on the revised earlier impact assessment, this consolidated impact assessment includes data on the presence of lead in toys and the origin of such toys as recently reported by Germany and Sweden and uses a 5% allocation of the toxicological reference value for lead. The Toy Safety Directive 2009/48/EC (TSD) modernised the legal framework for toy safety in the EU. Applicable as of 20 July 2011 (for the chemical requirements a longer transition period has been foreseen, namely 20 July 2013) the TSD increases the level of safety for toys while ensuring their free movement on the market. The TSD introduces strict requirements for chemical substances in toys, and allows for a constant alignment of these requirements to the latest scientific developments by means of amending the chemical provisions. It contains an obligation to systematically review the occurrence of hazardous chemicals in toys, taking into account new scientific evidence and/or concerns raised by Member States. Similar provisions exist in other pieces of legislation, e.g. the restriction of lead in jewellery is accompanied by an obligation of review 5 years after its entry into force 12 . Thus, the Commission can propose amendments to certain chemical requirements when new scientific data is made available. In particular, the TSD contains specific migration limits for lead which are based on scientific evidence available in 2008, i.e. at the time of the legislative procedure. The current migration limits build on the Dutch National Institute for Health and Environment (RIVM) report 13 and on different scientific opinions, and they are based on the TDI, the weight of a child and the kind and amount of toy material ingested. A specific percentage of the TDI is allocated to toys, meaning that intake from toys cannot exceed 5% or 10% of the daily intake (from all sources, food and non-food products included). 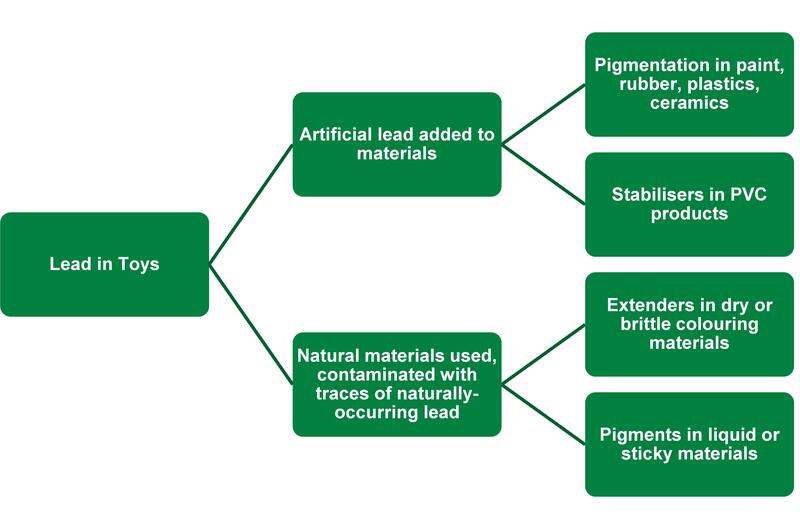 For lead, with an allocation of 5%, these limits are as follows: 13.5 mg/kg for toys made of dry materials, 3.4 mg/kg for toys made of liquid materials and 160 mg/kg for toys made of scraped-off materials. These limits apply only to toys where lead is accessible via sucking, licking or swallowing. Thus, they are mainly intended to protect children between 0 to 3 years of age (where such behaviour exists), but they also protect older children, when they have a similar behaviour. Independent scientific committees appointed by the European Commission (e.g. the Scientific Committee on Health and Environmental Risks - SCHER) can evaluate scientific data provided by other scientific committees or institutions on request. This was the case for the above mentioned RIVM report, whose methodology for establishing limit values for toys was validated by SCHER in 2010. The former Toy Safety Directive 88/378/EEC established bioavailability limits for chemicals in toys, including lead. The bioavailability level for lead, according to this directive, should not exceed 0.7 µg/day. The European standard EN 71-3 Migration of certain elements has translated this into an upper limit of migration of lead from toy material, corresponding to 90 mg/kg. This transposition was based on the hypothesis that the average intake of any toy material is 8 mg/day, whether dry, liquid or scraped-off. Toys may contain lead; it can be intentionally added in materials or present in toys due to raw materials naturally contaminated. For example metal alloys and painted parts may be contaminated by lead. Interviews with industry associations (see Annex IV) suggest that metal parts and regular paint are not the most important sources of lead contamination. When parts and painted materials are coated and the toy material is solid (e.g., metal parts, painted plastic toys), migration of lead can occur only from scraped-off material. Modern synthetic paints, moreover, do not contain lead, unlike in the past. Dust from metal alloy parts in constructional toys (such as screws, bushings, washers) are a source of scraped-off material, but may lead to problems for industry if it is considered a powder-like material for which a tighter limit value would apply. For liquid toys and brittle or pliable toy materials, manufacturers may incidentally use raw materials that are naturally contaminated by lead. Colouring pigments (such as titanium dioxide), and softeners or fillers (such as kaolin and clay) are used in Arts and Crafts toys such as modelling clay, colour pencils, paint tablets, powder paint, liquid finger paints and poster paints, pastels and wax crayons. These materials are often an important element in the toy (up to 80% of the material as in colour pencil leads), and have a crucial role for the technical functioning of the product (e.g., ensuring gradual abrasion without breaking, enabling opaque colouring). According to information received from the industry (see Annex VI) there are currently no alternatives to replace lead in certain toys. This is because the presence of lead in these toys is due to naturally contaminated raw materials. There are no suitable substitutes for these raw materials either, according to the same sources mentioned above. For the purpose of the sector's overview, liquid, sticky and brittle, dry or pliable toys will be referred to as Arts and Crafts toys. The first category of toys above falls under the heading of "Other toys". There are about 2,000 companies involved in the toys and games sector in the EU. Most are small and medium-sized enterprises (SMEs). The toy industry directly employs nearly 100,000 people in the EU in production, research and development, marketing, sales, distribution, and many other services. The total production of toys in the EU in 2010 was mostly generated by France, Germany, Italy, Ireland, Spain, the UK, Denmark, the Czech Republic, Malta and Poland. The total exports of toys 14 from EU27 countries to non-EU countries in 2010 was €1.05 billion. The total imports of traditional toys from non-EU countries to EU27 in 2010 was €6.96 billion. Toys are manufactured globally but China is by far the biggest exporter of toys in the world. Some 85% of all toys on the European market are produced in China, by both EU and non-EU manufacturers. The toys that come onto the European market find their way to final consumers via different routes. 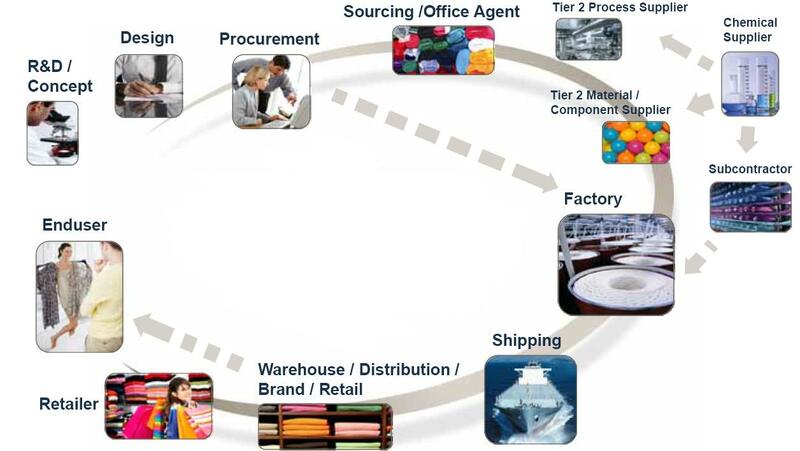 As depicted in the figure above, the toy value chain consists of different types of actors that each play their own distinct role. The way these various actors interact with each other depends largely on their position in the supply chain. While the bigger economic operators typically have full control over product design, manufacturing and distribution, many retailers tend to have control only over manufacturing and distribution, with traders only having control over the distribution but not in any significant way over design and manufacturing. The picture illustrates the roles of different actors. It all starts by creating a concept and designing a toy according to the applicable legislation. Different suppliers interact, delivering the assemblies, parts or chemicals used before starting the production in a factory. The finalised product leaves the factory and is shipped to its corresponding market, e.g., the EU market. Once declared that it can freely move and be stored and sold by retailers, and toys end up on the shelves of shops. The end user, the consumer, will buy the product and take it home. In this specific case, the end users are children playing with the toys. Their number 15 is estimated at 80 million within the EU. Lead is a heavy metal which takes both organic and inorganic forms. As it naturally occurs in the earth crust, it is contained in many natural resources such as zinc ore, silver and (most abundantly) copper. Lead is also found in the air, soil, water and food 16 as the result of human activities and due to its extensive use in industrial processes. Humans are exposed to lead via multiple sources: dietary (water, food) and non-dietary (air, soil, consumer products such as toys). The Scientific Committee on Health and Environmental Risks (SCHER) considers that the exposure to lead via toys should not exceed a maximum of 10% of the lead's daily intake (from all sources) 17 . Children, especially under the age of six, absorb greater amounts of lead than adults, even when the absolute exposure to lead is identical 19 . 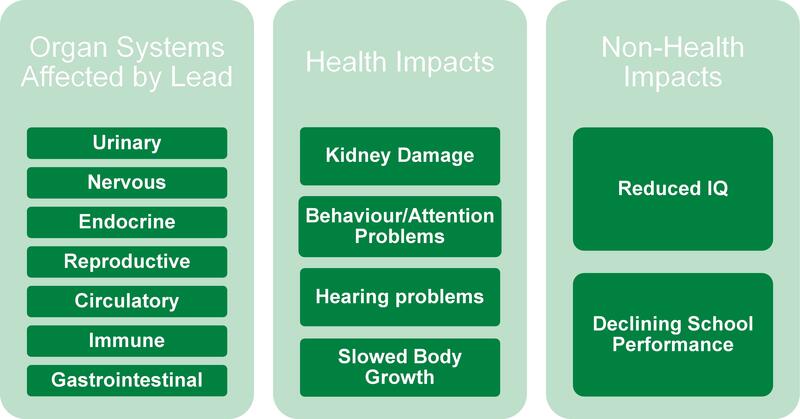 The figure below summarises the effects and impacts of lead exposure in children. The current lead limit values in the TSD reduce to trace levels the amount of lead which may occur in toys. Below these limit values, it is considered that exposure to lead has no critical health effects. However, these limit values, adopted in 2009, have been recently invalidated by new scientific evidence. In 2010, the European Food Safety Authority (EFSA) 20 concluded that for lead, as a toxic metal, there is no threshold below which exposure to lead has no critical health effects. In non-human primate models, even low-level exposure to lead has caused neurotoxicity (i.e. damage to the nervous system and/or brain), in particular learning deficits. The new toxicological reference value is the BMDL01 relating to neuro-developmental effects. The BMDL01 is the lower confidence limit (95% percentile) of the benchmark dose of a 1% extra risk of intellectual deficits in children measured by the Full Scale IQ score, i.e., a decrease in IQ by 1 point on that scale 21 . The BMDL01 is equivalent to an intake of 0.5 µg lead/kg bodyweight/day. In light of these findings, it is necessary to revise the limit values for lead in toys. Lead is present in a wide range of materials in the environment, in both organic and inorganic form (Table 3). Consequently, children may absorb lead through dietary or non-dietary exposure, and face health consequences. Toys represent one of many channels of children’s exposure to lead. Raw materials, which are contaminated with traces of naturally-occurring lead, without any added value for the functioning of the toy have to be used to produce the toy. For pigmentation in paint, rubber, plastics and ceramics. Examples of toys that could contain lead for pigmentation include painted blocks, metal cars, tea sets, etc. As a stabiliser in PVC 22 products – for softening plastic to make it more malleable. When lead is used to soften plastic in toys, it makes the plastic degrade to lead dust on overexposure to heat, which is toxic for anyone who comes in contact with it. Examples of toys that could contain added lead as a stabiliser include toy balls, toys from vending machines, etc. As extenders (e.g. kaolin, chalkstone, clay, talc or other grinded rock materials), in dry or brittle colouring materials to maintain stability, breaking resistance and smoothing abrasion without scraping. Examples of toys that could contain natural materials contaminated with traces of naturally occurring lead include chalks, pencils, pens, crayons 23 – i.e. primarily in the Arts and Crafts industry. As pigments (e.g., iron oxides, titanium dioxide, barium sulphate), in liquid or sticky materials to render them opaque. Examples of toys that could contain natural materials contaminated with traces of lead include paints 24 – i.e. primarily in the Arts and Crafts industry. Toys that contain traces of naturally occurring lead include: chalks, coloured pencils, fibre pens, finger paints, drawing games (Spiro games), modelling materials, water colours, wax crayons, window colour, fancy products 25 . In May 2013 data from German market monitoring programmes, carried out in 2010 and 2011, provided detailed migration data on lead in toys 26 from 2,496 toy samples tested. Tests included toys made with contaminated natural raw materials such as finger paints, colour pencil leads or water paint tablets. The results of the market monitoring are shown in the table below. Very few other data on lead in toys are available. The table below shows that on average (see column "median"; the median is also called "50 percentile": 50% of the samples examined have a lead content that is below the 50 percentile expressed in mg lead/kg toy material. Of course the remaining 50% of the samples are above the median.) lead was not detected in the toys tested, with the exception of colour pencil leads with 1.5 mg/kg lead. The 90 percentiles (90% of the samples tested have a lead content that is below the 90 percentile expressed in mg lead/kg toy material. The 90 percentile encompasses near to all samples.) again show some higher value for colour pencil leads (6 mg/kg), but also for water paint tablets (10.2 mg/kg). In conclusion, the market monitoring results suggest that colour pencil leads and water paint tablets, which belong to the Arts and Crafts toys, had a somewhat higher lead content than most other toys. In all cases, however, the 90 percentile was clearly, or even considerably, below the current TSD limit values for lead. These conclusions were supported by a limited market surveillance action in Sweden 27 regarding colour pencil leads. There are several ways in which children can generally be exposed to lead, though some of these are deemed not particularly significant in the context of toys 28 . The table below summarises children's exposure to lead. The scenarios of direct ingestion and mouthing are relevant for toys. Oral exploration behaviour in children below 3 years of age implies that all sorts of toys could be both mouthed and ingested by them. Children above 3 years could also mouth toys intended to be placed in the mouth, as well as ingest scraped-off material from them. Nature of exposure: Skin contact is not a significant channel, because dermal uptake of lead is very low. Eye contact effects, such as eye irritancy, are of a mild and transient nature. The ways in which, and the extent to which, children are exposed to lead through toys has been a key issue of interest in the scientific and policy making communities. RIVM 29 estimates that 8 mg of scraped-off, 100 mg of brittle and 400 mg of liquid or sticky toy material are ingested by a child every day. This implies that if such toys contain traces of lead, a small amount of lead will be ingested by children. As children of a young age are constantly exposed to toys, toys partially manufactured with or containing lead are a problem driver for lead exposure in children and its resulting neurotoxic effects. This is true even if the proportion of children's lead exposure due to toys is small, in particular in the context of more relevant exposure sources (i.e. water and food). The consequences of exposure to lead manifest themselves only once the chemical is absorbed in the blood stream and accumulates in organs and tissues. Thus, the health impacts of children’s exposure to toxic metals, including lead, via toys can only be measured through the bioavailability of the material in the blood stream. Bioavailability is defined as ‘the amount of each element in the toy which could be absorbed into the systemic circulation of a child’ 30 . Estimates of the amount of lead that can be absorbed into the blood circulation of a child can be measured taking into consideration the various steps of the digestive process. If the toy contains lead, during digestion in the gastro-intestinal tract, lead might be partially or totally released from the toy material ingested. 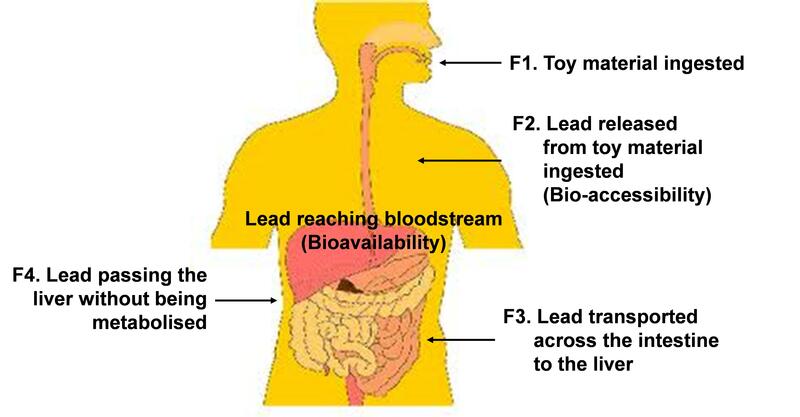 The fraction of lead released from the toy material ingested is potentially available for transport across the intestine. Part of the lead absorbed through the intestine will be metabolised by the liver (i.e. eliminated via urine). Other part will not be metabolised and it will hence reach the blood. This non-metabolised part exerts toxicity in the organs and tissues, with consequences for the child’s health. This process is outlined in the table below. slowed body growth (MedlinePlus, 2011). Moreover, lead absorption might also have impacts on the individual’s quality of life, which are not necessarily health related. For instance, lead may reduce IQ and productivity 34 as a result of its effect on the nervous system, or it may affect fertility rate, through its effects on the reproductive system. Both the health related and non-health related impacts of lead absorption may imply a reduction in individual quality of life, increased treatment costs for society and generate a reduction in the individual's productivity. More evidence on these impacts is presented in Annex II. Source of lead in food primarily as a consequence of air pollution. Largest contributors to overall food lead exposure across the EU are vegetables, nuts and pulses (between 14% - 19%), as well as cereals and cereal products (13% - 14%) 35 . For young children, this particularly includes some calcium supplements, infant formulae and breast milk. Primarily from steel and iron industries, as well as from lead production and processing operations. Lead exposure via water, this is generally higher for those living near hazardous waste sites 36 . For children between 0 and 7 years old, estimates of reported dietary exposure range from 0.21 to 3.10 μg/kg bodyweight per day 37 . Primarily from anthropogenic sources, i.e. metal production, manufacturing industries, electricity and heat production. In the USA, household lead paint and related dust and chips are a particularly large source of high lead levels in children, though less so in the EU. Bioavailability of atmospheric lead has decreased rapidly over the past forty years, because of regulations banning the usage of lead in petrol. For children, air exposure is split into outdoor air and environmental tobacco smoke. Daily outdoor air lead exposure is estimated to be between 0.001 and 0.003 μg/kg bodyweight per day in children. Daily environmental tobacco smoke lead exposure between 0.012 and 0.052 μg/kg bodyweight per day in children 38 . Important source of lead exposure for children. This includes, e.g. lead dust in carpets and dust near waste sites. It is estimated that children are exposed to between 0.18 and 0.80 μg/kg bodyweight on a daily basis 39 . The Scientific Opinion on Lead in Food, issued by the Panel on Contaminants in the Food Chain at the European Food Safety Agency (EFSA) 40 shows that the dietary lead exposure estimates for children exceed the new toxicological reference value BMDL01 (which is equivalent to 0.5 µg lead/kg bodyweight/day), as summarised in the table below. How many times does the exposure exceed the BMDL01 (0.5 µg lead/kg bodyweight/day) ? A lead intake at the level of the BMDL01 is considered to be the highest tolerable exposure level for lead 41 . Since the current average blood lead levels in European children are higher than this highest tolerable exposure level, and since no threshold for the neuro-developmental effects has been established, any additional exposure must be avoided as far as possible 42 . Toys represent one of many channels of children’s exposure to lead. Whilst it is difficult to assess how much of the daily quantity of lead children are exposed to actually comes from toys, an extensive review of the relevant scientific literature on exposure channels indicates that the proportion of children’s lead exposure that is due to toys is small. In particular, this proportion must be regarded in the context of several other more significant lead channels, as depicted above. Children playing and being exposed to toys containing lead traces are the main affected parties. The exposure is made mainly via the mouthing and direct ingestion of toy materials containing lead. The mouthing behaviour is specific for young children aged from 0 to 3 years. Therefore they will be the main beneficiaries of the potential measures aiming at reducing levels of exposure to lead from toys. Statistics show there are 16 million children below 3 years of age in the EU 43 . The lead limit values in the Toy Safety Directive 2009/48/EC 44 (TSD) as adopted are 13.5 - 3.4 - 160 mg/kg in dry - liquid - scraped-off toy materials, respectively. They are based on a Tolerable Daily Intake (TDI) of 3.6 µg/kg bodyweight/day 45 , 46 as the toxicological reference value. They are equally based on the requirement of the TSD that the lead intake from toys should not exceed 5% of the TDI 47 , due to the particular toxicity of lead. Due to new scientific knowledge published by the European Food Safety Agency (EFSA), there is no longer a (lower) threshold for neuro-developmental effects from lead. Therefore there is no longer a TDI 48 , 49 . The new basis, or toxicological reference value, for establishing a lead limit for children is the BMDL01 relating to neuro-developmental effects. The BMDL01 is the lower confidence limit (95% percentile) of the benchmark dose of a 1% extra risk of intellectual deficits in children measured by the Full Scale IQ score, i.e., a decrease in IQ by 1 point on that scale 50 . The BMDL01 is equivalent to an intake of 0.5 µg lead/kg bodyweight/day. As referred to above, during the establishment of the TSD it was considered that the limit values for several elements which are particularly toxic, amongst which lead, should be set "at levels that are half of those considered safe according to the criteria of the relevant Scientific Committee" 51 . The opinion of the Scientific Committee on Toxicity, Ecotoxicity and the Environment (CSTEE) from 2004 52 recommended that toys should not contribute above a maximum of 10% of the total lead intake by children. The successor to the CSTEE, the Scientific Committee for Health and Environmental Risks (SCHER), concurred with the approach to limit the uptake to 10% of a toxicology-based reference value 53 . The TSD therefore set the limit values for lead (and five further metallic elements or compounds, namely arsenic, cadmium, chromium-VI, mercury, organic tin) 54 at only 5% of the then existing toxicology-based reference value, the TDI 55 . Since the TDI is no longer the toxicological reference value but instead the BMDL01, the present consolidated impact assessment considers an allocation of 5% of the BMDL01. The table below shows the limit values for lead in toys, revised in accordance with the approach of the TSD. To note that, according to the new scientific knowledge, lead is a non-threshold substance: It exerts toxic effects even at most minor concentrations. Lead should therefore not be present in toys, and the limit values should be set, as recommended by standard EN 71-9 56 , at the lowest level achievable, which would be the Limit of Quantification (LOQ) of the analytical method applied. This would mean that the revised limit values for lead in toys should be set at the LOQ of lead as given in EN 71-3 which is designed to test the migration of lead (and of the other metal elements and compounds listed in Annex II, section III, No. 13 of the TSD) 57 , namely at 0.122 mg/kg in any toy material. However to keep consistency with the TSD this consolidated impact assessment considers the limit values given in the table above. As referred to above EN 71-3 reports a typical Limit of Quantification (LOQ) for lead of 0.122 mg/kg. This is at least 4 times lower than the revised limit values proposed in the table above. Toys can therefore be tested for the revised limit values already today, without any investment into laboratory equipment or laboratory capacity. 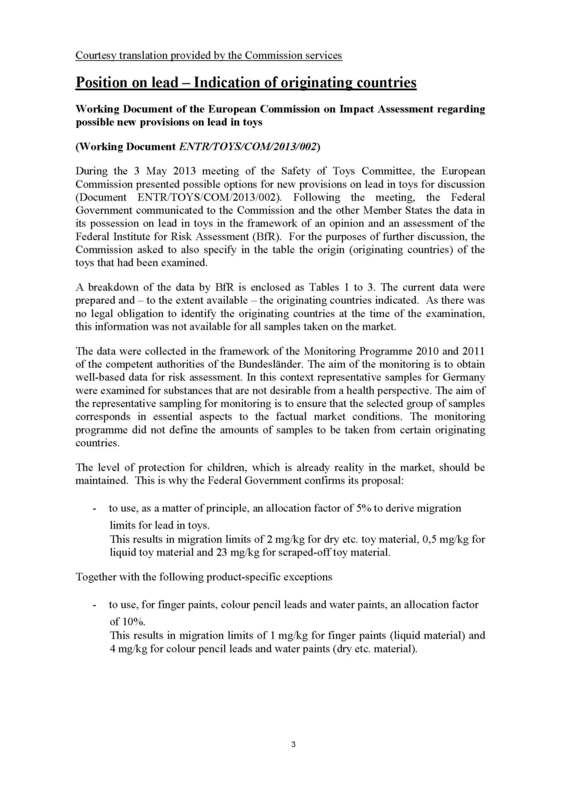 In May 2013 data from German market monitoring programmes, carried out in 2010 and 2011, provided detailed migration data on lead in toys 58 . Almost 2,500 toy samples were tested for lead, including toys made with contaminated natural raw materials such as finger paints, colour pencil leads or water paint tablets which belong to the Arts and Crafts toys. The results of the market monitoring are shown in the table below. Very few other data on lead in toys are available. The table shows that the overwhelming majority of the toys tested already complied with the lead limit values derived from a 5% allocation of the BMDL01. Compliance rates varied from 91% to 100%. This reflects the variability of samples encountered in any market surveillance activity and can broadly be considered as reflecting compliance. Only finger paints, colour pencil leads and water paint tablets had lower compliance rates, namely 75%, 73% and 83%, respectively. Finger paints: Only 55% of finger paints from one Member State complied with a 5% allocation of the BMDL01 while the figure for another was 67% and for a third, 90%. However 100% of finger paints from China or of unknown origin were compliant with such a limit value. A simulation with a 10% allocation of the BMDL01, reflecting the opinion of SCHER 60 , again gave low compliance rates for the 3 Member States of 86%, 67% and 90% (the latter two unchanged) for finger paints. Thus many of these finger paints were non-compliant with the limit values in both simulations. This was confirmed by analyses carried out on 3 finger paints on the Swedish market, originating from a further Member State and from China 61 . These finger paints were non-compliant in simulations with both a 5% and a 10% allocation of the BMDL01. In conclusion, it is possible to manufacture compliant finger paints, while non-compliant finger paints on the market pose a health risk to children since they do not even comply with a 10% allocation. Colour pencil leads: In the case of one Member State, no colour pencil leads complied with a 5% allocation of the BMDL01 while the figure for another was 60% and for a third, 65%. The figure for China was 85%, while only 71% of colour pencil leads of unknown origin were compliant with such a limit. However 100% of colour pencil leads from a further Member State and from Brazil as well as 94% identified as being ‘from Europe’ complied with the 5% allocation limit. Under a simulation with a 10% allocation of the BMDL01 the compliance rates rose in certain cases. However for the three Member States above, compliance rates were still only 14%, 60% (unchanged) and 85%. For China it was 91% and it was 88% for colour pencil leads of unknown origin. Thus colour pencil leads from many origins remained non-compliant. Furthermore, from 3 colour pencil leads on the Swedish market (from 2 Member States and Indonesia), only 1 was compliant with the 5% allocation, although all 3 products were compliant under a simulation with a 10% allocation. Thus, while the data show that it is possible to manufacture in compliance with a 5% allocation of the BMDL01, the colour pencil leads of a majority of origins can be considered to pose a health risk to children since they remained non-compliant in a simulation with a 10% allocation of the BMDL01. Water paint tablets: In the case of one Member State only 79% of water paint tablets complied with the 5% allocation of the BMDL01 (rising to only 80% with a 10% allocation). However 100% of those from two other Member States, those identified as being ‘from Europe’, those from China and those of unknown origin were compliant with such a limit. The analyses of water paint tablets on the Swedish market also showed that all 3 samples (from three further Member States) complied. Thus the water paint tablets from a large majority of origins were compliant, while most non-compliant paint tablets on the market pose a health risk to children since they did not even comply with a 10% allocation. In conclusion, most of the finger paints, colour pencil leads and water paint tablets which did not comply with the 5% allocation of the BMDL01 remained non-compliant even with a 10% allocation, and these toys can be considered to pose a risk to the health of children. On the other hand, it is possible for manufacturers to produce such kinds of toys that comply with a 5% allocation of the BMDL01. In case of no action, the limits established in the Toy Safety Directive 2009/48/EC would remain unchanged, i.e. 13.5 mg/kg in dry materials, 3.4 mg/kg in liquid materials and 160 mg/kg in scraped-off materials. Children would continue to be exposed, via toys, to a high amount of lead, which can lead to kidney damages, hearing problems, behaviour and attention problems, and slowed body growth. an increase in health cost due to medical treatment, such as drug cost, hospital treatment cost, etc. a reduction in productivity, measured as work days loss due to the health condition, multiplied by the average wage. Poorer quality or performance of some toys (e.g. range of colours; abrasion characteristics, etc.). The allocation of the toxicological reference value for the revision of the limit values is 10%. The allocation of the toxicological reference value is 5% since the current lead limits in the TSD are equally based on a 5% allocation. the health benefit figures of the earlier impact assessment will be multiplied with 6.5% (0.065) for the purpose of this consolidated impact assessment. This is a very crude approach and may underestimate the health benefits, since the proposed revised limit values of this consolidated impact assessment are only half as high as the limit values proposed in the earlier impact assessment, due to the allocation of only 5% (instead of 10%). However, halved limit values do not translate into half a lead concentration in the blood of children, and also not to doubled health benefits. the economic costs will be left as estimated in the earlier impact assessment. This is again quite approximate, since manufacturers of Arts and Crafts toys may have to make additional efforts to find raw materials that are even less contaminated with lead. However, efforts will not cost double as much since there is no relation between the search effort and the level of contamination. Furthermore, as shown above by the market monitoring data, there are indeed Arts and Crafts toys on the market that comply with the proposed revised lead limit values. It is therefore well possible to find appropriate raw materials and place the resulting toys at a competitive price on the market. On balance, therefore, it may be sufficient to retain that the economic cost figures are only approximate. The toy safety legislation is based on Article 114 TFEU guaranteeing the functioning of the internal market. According to the principle of subsidiarity (Article 5.3 of the TFEU), action on EU level should be taken only when the aims envisaged cannot be achieved sufficiently by Member States alone and can, by reason of the scale or effects of the proposed action, be better achieved by the EU. The preceding analysis has shown that children are equally exposed to lead, and this exposure leads to health consequences. Thus, the TSD aims at guaranteeing an equal level of protection to all EU children, while eliminating obstacles to the free movement of toys with the EU market. Individual actions undertaken by Member States, intended to protect children's health from lead exposure via toys, would result in children being unequally protected within the EU. Additionally, such individual measures could lead to a fragmentation of the internal market and create barriers to toys' trade. The general objective of this initiative is to ensure a high level of health protection, while safeguarding the free movement of goods within the EU. The absence of a common harmonised level of protection would encourage Member States to take disparate national measures to protect their consumers; such national measures would jeopardise the free movement of toys on the EU market. Germany for example considers that the limit values currently contained in the TSD are not strict enough and requested permission to apply stricter values, in order to better protect the health of children 64 . To maintain the free movement of toys within the EU. To ensure that this maximum amount applies to all toys marketed on the EU market. At EU level, the presence of lead in ceramics and plastic materials which come into contact with food is already restricted 65 . The REACH Regulation bans the use of lead compounds in paint 66 . The presence of lead and its compounds in jewellery is also restricted, in order to reduce health risks 67 . Lead is also restricted in foodstuffs (major source of exposure) by Regulation 1881/2006 68 . For example, the maximum amount allowed in milk is 0.020 mg/kg and in cereals 0.20 mg/kg. In drinking water (other major source of lead exposure), the Drinking water directive establishes a maximum amount of 10 µg/l as from December 2013. With regard to drinking water in particular, the Scientific Committee on Health and Environmental Risks (SCHER) recommends, in its 2011 opinion on lead in drinking water, a further reduction of the lead exposure as a warrant for the reduction of the risks on health. Further restrictions for lead are being considered in the framework of the Codex Alimentarius 69 and a so-called Annex XV dossier has been submitted by Sweden under the REACH Regulation for the purposes of restricting lead and its compounds in articles which are supplied to the general public and can be placed in the mouth by children, if the concentration of lead (expressed as metal) in the article is equal to or greater than 0.05% by weight. As regards the classification of lead at EU level for adequate risk management, Sweden submitted a proposal for a harmonised classification of lead as a reprotoxic substance 70 . The use of lead in food and non-food products is internationally restricted as well. In the US for example, lead in not allowed in toys and child care articles at concentrations above 100 ppm. In drinking water, the Safe Drinking water Act sets out a maximum contamination goal of 15 ppm. Baseline option: Maintaining children's exposure to lead via toys at the level determined by the TSD in 2009, without taking into account the evolution of the lead related scientific knowledge. The limit values to be maintained are as follows: 13.5 mg/kg in dry materials, 3.4 mg/kg in liquid materials and 160 mg/kg in scraped off materials. Option 1: Soft law / self-regulatory approach: Inviting the toy industry to put in place voluntary agreements on reducing lead exposure via toys. Option 2: Labelling of toys containing lead in order to raise awareness amongst consumers on the health risks due to exposure to lead via toys. This option would imply the following limit values: 2 mg/kg in dry materials, 0.5 mg/kg in liquid materials and 23 mg/kg in scraped-off materials. Option 3b): Partial revision of the current limit values: reducing the limit values for lead in all toys and all categories of toy material in line with the latest scientific knowledge except those toys made with raw materials naturally contaminated with lead. This option would imply the following limit values: 2 mg/kg in dry materials, 0.5 mg/kg in liquid materials and 23 mg/kg in scraped-off materials, except for clay, kaolin, pigments and others, where the limits would remain as follows: 13.5 mg/kg in dry materials, 3.4 mg/kg in liquid materials and 160 mg/kg in scraped-off materials. Option 3c): Revision of the current limit values according to feasibility: reducing the limit values for lead in all toys, in line with what is feasible for the industry according to the current state of the art. This option is based on EWIMA's position paper (Annex VI). This option would imply the following limit values: 9 mg/kg in dry materials, 3.4 mg/kg in liquid materials and 50 mg/kg in scraped-off materials. Option3a) I - Extended transitional period for the Arts and Crafts industry, due to the negative economic impacts expected. This will allow more time for putting in place innovative solutions to replace certain raw materials for example. Option 3a) II - Extended transitional period for SMEs, for which the costs will be higher than for larger companies. Option 3a) III - Exemption of SMEs from the new limits. The impact assessment will focus on economic and social impacts. Those will be assessed in relation to economic operators involved in the manufacturing and marketing of toys, and in relation to children exposed to lead via toys. Environmental impacts will not be assessed in this impact assessment. Environmental protection per se is not within the objectives of the Toy Safety Directive (TSD). The disposal of toys is governed by a number of existing Directives such as WEEE 71 , ROHS 72 , the Waste Directive 73 and Packaging and Packaging Waste 74 . Other relevant horizontal legislation includes the Batteries Directive 75 and REACH 76 . No direct environmental impacts are thus expected from this initiative under the TSD. Social impacts in this specific case translate into health impacts and impacts on employment. an increase in productivity (because there would be less work days lost due to otherwise poor health condition). The assessment of the health impacts is based on the assumption that 100% of toys subject to the EU legislation would comply with it. This assumption is based on evidence suggesting that a very small percentage of toys tested fail to meet the current requirements in terms of chemical substances 77 . In addition, this consolidated impact assessment assumes that only a limited range of toys, namely some Arts and Crafts toys referred to further above (finger paints, colour pencil leads and water paint tablets), would exceed the proposed revised lead limit values. This assessment further takes into account that the children most exposed are those below 3 years of age, because of their pronounced mouthing behaviour. Their number is estimated at 16 million in the EU (see the assumptions in more detail in Annex II and Annex IX). Impacts on employment translate into jobs lost in the toy sector. Higher compliance costs may provide incentives for offshoring production, in order to reduce labour costs. One can assume that these are mainly design and marketing related jobs, as most of the toy production is outsourced. Affected Member States are those where most of the toy companies are established (e.g. Italy, France and Germany). Raw material costs implying the search for higher quality raw materials, which are more rare and thus more expensive. These costs are one-time adaptation costs. Analytical costs imply the costs related to quality control procedures for the production process and final product. This involves the testing of raw materials and ultimately the toy material itself. Testing can be done in house or externally. Such testing may face various difficulties and may become complex and more costly if lead limits are reduced. First, higher quality raw material (i.e. raw materials with a low lead content) does not necessarily ensure lower lead migration in toy material. Second, the toy must meet the migration limits for other chemical elements which may also be present. Natural raw materials may contain up to 90 chemical elements, and the TSD regulates 19 of them. Thus, the raw materials may contain less lead, but still have to comply with limit values for other chemical substances in order for the final toy to be compliant. These analytical costs may imply also training costs to adapt to more complex testing procedures and possibly costs for new testing equipment. Some of these costs, such as new testing equipment and training are one-time adaptation costs. All the others are considered as recurrent costs. Developmental costs imply the development of toys that can meet the reduced migration limits and retain their technical function. Reformulation of products by use of substitute materials, such as artificial pigments, may impair the quality of use of the product (e.g. the breaking resistance of colouring pens). These costs are considered as being recurrent costs. This is because human and physical capital needs to be replaced over time. Testing costs are fixed production costs per product in the toy catalogue, but they are recurrent over time for quality control and monitoring reasons. Material related costs are variable costs of production. Additionally, these costs are putting pressure on budgets for new product development and thus on the sector's capacity to innovate (in terms of the costs of research and development involved). On the upside, higher health and safety standards offer opportunities for marketing toys by referring to enhanced safety for small children (combined with their educative role). This could also be an asset on the global market, where consumer safety regulation is often less strict. According to the results of the public consultation (Annex III), 21% of respondents consider that tightening the limit values for lead will improve their competitive position on the market due to the enhanced quality of their products. Due to a lack of representative quantitative information on some of the impacts, qualitative statements were the best available data on which the report had to base itself. The quantifications, i.e. a thorough analysis has been carried out for the impacts deemed the most relevant (i.e. health impacts and economic cost impacts). Other impacts, in particular those related to the competitiveness of the toys sector have been acknowledged but could only be underpinned with qualitative statements. The baseline option will not imply any additional costs for economic operators, testing laboratories nor national authorities in charge of market surveillance, because no change compared to the current applicable situation is expected. The current situation (namely the new TSD adopted in 2009) generated economic costs amounting to 26 million euro 78 . The baseline option will not bring about any improvement to the protection of children's health. Children will continue to be exposed to lead via toys since they ingest toy material due to their mouthing behaviour. Part of the lead contained in the ingested material will remain in the child's body, and will be absorbed into his/her blood - the bioavailability fraction of lead. This bioavailability fraction of lead exerts toxicity and causes health consequences such as: kidney damages, hearing problems, behaviour and attention problems and slowed body growth. The related health costs will remain. The baseline option results in a life time total health costs of € 9,234 million for ADHD and € 6,526 million for IQ. 79 No additional health benefits are expected from the baseline option (see Annex I and II for the explanation of calculations). The baseline option will not imply any job losses in the toy sector, as no change compared to the current applicable situation is expected. The current situation (namely the new TSD adopted in 2009) was estimated to generate around 200 job losses, accounting for 2.5 million euro 80 . There are, of course, no incremental benefits expected from the baseline scenario. Option 1) Soft law / self-regulatory approach: While a voluntary agreement may present some advantages for economic operators such as manufacturers or distributors, it risks not being the most time efficient, because of its non-binding character. It also raises major uncertainties as to the sector capacity to self-regulate, even if the industry showed an excellent record on compliance, following enforcement activities carried out by Member States. This record on compliance refers to mandatory rules established by legislation. There is no certainty that this compliance record would have been the same in the case of non-mandatory rules. Considering that optional rules, without any enforcement (or sanctions) possibilities, would not be equally respected appears as a logical assumption, especially when most of the toy production is based in China, where we register the highest level of non-compliance. This is supported by the results of the joint market surveillance action results published in 2010, showing that 64% of the toys not complying with the toy safety chemical requirements were coming from China. RAPEX reports also show that the share of Chinese non-compliant toys found on the EU market is very important (e.g., 54% in 2011). Companies tend to maximise their profit and this does not come hand in hand with fully protecting consumers. Assuming that self-regulation would take place in a certain sector, uncertainties still exist as to the number of economic operators willing to implement the measures, and thus as to the real benefits for children's health. Finally, the health of children is a too important and too sensitive issue to be left unregulated. Thus, this option has been discarded and will not be assessed further. Option 2) Labelling of toys containing lead may imply fewer costs for economic operators, as it is less expensive to put in place labelling systems than ensuring compliance with newer and stricter safety rules. Also, evidence shows that information to consumers is a vital part of any product. Labelling increases the consumer's awareness and its ability to make a reasoned choice. It also increases the provider's commercial reputation. However, research on the way consumers would perceive warnings and other type of information provided is necessary before introducing them. Such research should be done across consumers from all social, economic and cultural groups, in order to test if the level of perception is similar and to judge the usefulness of such warnings or labelling. In the meantime, children would continue to be exposed to a high amount of lead exerting toxicity and resulting in diseases. It is noteworthy that consumers are not fully aware about the presence of lead in consumers' products and the related health consequences. Therefore labelling or warning on toys only could be misleading and disproportionate for the consumer, as the main exposure to lead comes from food and air, where such labelling is currently neither provided nor foreseen. Parents buying toys would believe that the presence of lead and its health consequences is an issue specifically related to toys, while this is a general problem concerning all exposure sources (food and non-food sources). Additionally, such warnings, if present, would be reaching the appropriate target to be protected – children – only indirectly, as they would be addressed at parents, not at children. Parents are the ones generally concerned by warnings, as they are the ones to buy toys. However, there is no information currently showing how such labelling would reach parents or care takers, as depicted above. Additionally, in relation to lead exposure, one cannot fully rely on labelling and warnings recommending adult supervision. Adult supervision even if fully applied, cannot fully prevent lead exposure. Thus, this option has been discarded and will not be assessed further. This option will imply additional costs for certain economic operators as well as health benefits the magnitude of which will vary depending on the selected sub-option. Sectors upstream the toy manufacturing industry in the value chain would not be affected much by policy option 3). The toy industry is a small client for mining companies providing the raw materials. They would not be impacted by policy option 3) because they provide several qualities to large industrial clients across various sectors. Mining firms do not market their materials, such as kaolin and clay, specifically for toys producers. They choose a suitable material from the available product range as price takers. For similar reasons, policy option 3) also hardly affects manufacturers of pigments and colorants. Testing facilities would see an increase in demand from toy manufacturers as a result of policy option 3). They will need to test different qualities of raw materials and intermediates to assess whether they meet the chemicals related requirements, including those on lead. Testing facilities may need some more sophisticated equipment to reach the required accuracy and reliability, particularly for liquid toys such as paints. Because testing laboratories may need to make additional investments specifically for the analysis of toys, the number of facilities that will continue to offer services to toy manufacturers may decline, and the price level of external testing may increase. Downstream in the value chain, wholesale and retail providers are not likely to be very much affected. Apart from small and specialized retail shops, retailers offer a wide spectrum of toys and Art and Crafts products. Consumers may be able to purchase certain products (e.g. colouring pencils), which participate to the development of children's creativity, if these go out of the market. They may shift their expenditure to other toys and games, at least partly. Poorer quality or performance of some toys (e.g. range of colours; abrasion characteristics, etc.). The costs would be higher for SMEs, for which possibly more complex testing procedures and the costly search for suitable raw materials, combined with a smaller range and scale of product lines, increase unit costs more. Furthermore, SMEs are more focused on local markets, rather than exports to third countries. This may limit the marketing advantage of child safety. Next to this, additional marketing and product development costs will put a bigger strain on SMEs resources, being fixed costs. On the positive side, SMEs stand to benefit more if option 3) lowers competition on the EU market and lose less if competition increases on export markets. This is because SMEs are more focused on local markets rather than export to third countries. SMEs are not less likely to pass on a cost increase into prices. This can reflect that they occupy a niche in a monopolistically competitive market. If this niche is mostly local, relatively sheltered from price competition, pass-on of costs is possible. Free entry and high competition may lead to zero profits in the long run. Costs then will be passed on into prices via the mechanism of entry and exit of firms. Prices would need to increase to reflect cost increases; demand would fall and fewer firms would survive. This is supported by the SMEs views expressed during the public consultation 81 - SMEs represented 70% of the respondents to the public consultation. According to Ecorys (Annex VIII), policy option 3a) results in an estimated impact that would amount to 89 million euro of production value. The worst case scenario would be a de-facto ban of certain toys (e.g. colouring pencils) based on the industry declarations that natural materials cannot consistently meet the lead migration limits (at least not without violating some other regulation on chemical elements 82 ) and substitutes are not readily available. This potential ban may lead to further loss of production up to a total displacement of these toys in the EU. This would imply a loss of 217 million euro. However, the ban of certain toys from the market following option 3a) is not an absolute certainty. Position papers from industry association claim that some toys could be banned from the market following option 3a), but there are currently no means for Member States or the Commission to verify whether this statement is fully reliable. Furthermore, this statement is not fully supported by the results of the public consultation. When replying to questions related to policy option 3a), certain toy manufacturers state that they will be able to continue manufacturing those toys, while others acknowledge not knowing yet if this will be still possible or not. As regards the marketing of the same products labelled "not toys", suggested by stakeholders, this option is not possible. The directive sets out a clear definition of a toy (products intended, whether or not exclusively, to be use in play by children under 14 years of age). All products entering into this category are de facto toys, and economic operators cannot circumvent this legal classification by labelling them as not being toys. 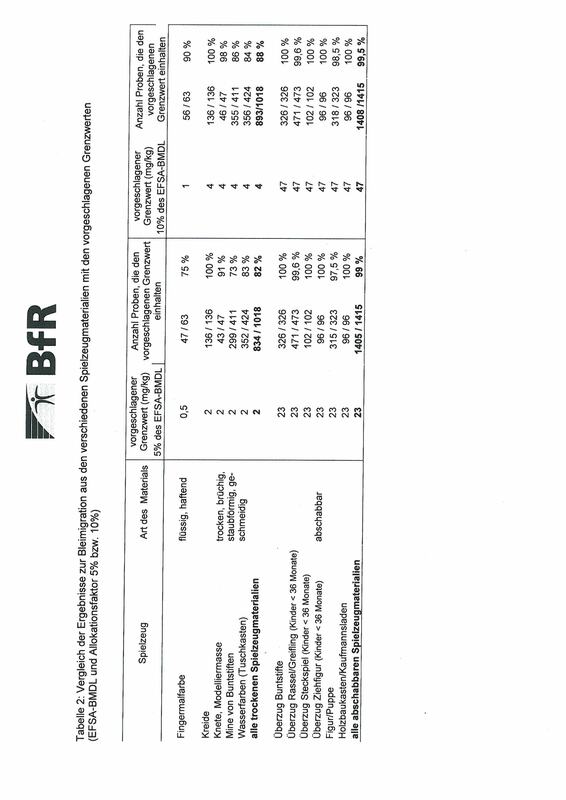 For details on the health benefits calculations see Table 2 of the relevant study (in Annex I). The health benefits shown in the table above are 6.5% of the benefits calculated in the relevant study (in Annex I). For explanation see section 3.8 of this consolidated impact assessment. It is important to stress that it is not possible to aggregate the benefits related to ADHD and those related to the IQ because the relationship between lead and health and non-health impacts is not mutually exclusive. For example, the effect of lead on ADHD could affect the IQ which has an impact on productivity. Alternatively, a child can experience an IQ impact with no experience of ADHD which also impacts productivity. The relationship between ADHD and IQ is not considered, therefore, aggregating these figures could lead to double counting of benefits. According to the Ecorys study (Annex VIII), policy option 3a) results in an estimated impact that would amount to 662 lost jobs, representing 8.5 million euro. The worst case scenario - a de-facto ban of certain toys – would amount to 2,112 lost jobs representing 27.5 million euro. These estimations are based on wage costs, and the share of personnel in production costs is used to compute wage costs. Industry challenged this policy option. According to the results of the public consultation and position papers received from industry associations (see Annexes III, V and VI), this option would lead to the potential ban of certain toys from the market. This is because these toys are made with raw materials naturally lead contaminated, and suitable substitutes are not available. This policy option is however supported by consumer associations, in particular ANEC and BEUC (see Annex VII). While acknowledging that certain toys made with naturally contaminated raw materials (e.g. colouring pencils, finger paints) are important for the development of children’s creativity and therefore should also be available in the future, ANEC and BEUC consider that children's safety cannot be compromised. Sub-option 3a) I - Extended transition period for the art and crafts industry would bring about an unequal situation among economic operators manufacturing and marketing toys made from naturally contaminated raw materials and other economic operators manufacturing and marketing toys. The latter would also be affected by the measures, although not to the same extent as their toys would not risk to be banned from the market, but would not be able to benefit from the transitional period granted. Also, there is no certainty that an extended transitional period would benefit industry for searching and finding any substitutes for naturally contaminated raw materials. Thus, at the expiration of the extended transitional period, art and crafts manufacturers may face the same situation, while children continued to be exposed to a high amount of lead resulting in health risks. These health risks are associated with important impacts on health as shown in the health benefits tables above and below. Thus, this option has been discarded and will not be assessed further. Sub-option 3a) II - Extended transitional period for SMEs and Sub-option 3a) III - Exemption of SMEs from the new limits would strongly undermine the benefits generated by the measures. SMEs are predominant in the toy sector. Available statistics show that they represent 85% of the companies involved in toy manufacturing and marketing. Thus, the measures would apply only to 15% of toys companies, and the intended health benefits would be limited to their market share only. Thus, these options have been discarded and will not be assessed further. The costs for the industry would be less significant than for option 3a), as toys made from naturally contaminated raw materials would be exempted from the revision of the current limits. The industry would be exposed to a tightening of the safety rules on lead, without facing a potential ban of some of their products. As regards impacts on SMEs, testing facilities wholesale and retail providers and consumers, the same considerations as under policy option 3a) are applicable. According to the Ecorys study (Annex VIII), policy option 3b) would result in an impact on production which amounts to 41 million euro. Option 3b) partial revision of the current limit values would bring about partial improvement to children's health, as they will be less exposed to lead via certain categories of toys. However, they will continue to be exposed to toys containing naturally lead contaminated raw materials. These toys are estimated to constitute around 6.5% of the global toys market share. The reduction of the bioavailability fraction of lead would result in incremental benefits compared to the baseline option as given in the table further below. the total benefit resulting from a change in the prevalence of ADHD will amount to 984 million euros for Policy Option 3a), and 935 million euros for Policy Option 3b). When considering a 55% probability of continuing ADHD throughout the adulthood, the benefit generated is 49 million euros. the total benefit resulting from a change in the prevalence of reduced IQ will amount to 982 million euros for policy option 3a) and to 936 million euros for policy option 3b). Even a minor decline of reduced IQ (e.g. 0, 80 % would still deliver significant benefits in the scale of 65 million Euros. In terms of employment, this option would generate 330 jobs lost, representing 3.9 million euro. This option would bring about a situation where health measures are not based on available scientific evidence and appropriate risk assessment methods, but are arbitrarily established on the basis of the Art and Crafts industry's statement of its capacity to find low-lead (or even lead-free) raw materials. Additionally, limiting the measures to what is considered to be feasible at the time of the measures will not trigger any incentive such as looking into better raw materials, substitute materials, innovative products and reducing lead exposure. Furthermore, children's exposure to lead would remain important, generating health risks. These health risks lead to important health impacts. Thus, this option has been discarded and will not be assessed further. The table above shows that the current TSD already provides considerable health benefits (some € 9 billion regarding ADHD, some € 6.5 billion regarding the IQ) with regard to the old Toy Safety Directive 88/378/EEC. At the same time the economic and social costs were relatively low (some € 30 million). Both option 3a) (= revision of the limit values for all toys) and option 3b) (= revision of the limit values for all toys with the exception of the Arts and Crafts toys) provide health benefits which are an order of magnitude higher than the estimated economic costs. Comparing them shows for option 3a) € 42 million higher benefits regarding ADHD, and € 59 million higher benefits regarding IQ. Thus the IQ benefit increase alone is higher than the increase in economic costs, which is € 53 million. The increase in ADHD benefits is € 42 million. This speaks in favour of option 3a). Further health benefits from strengthened lead limit values for toys may arise from avoiding other health related consequences, as referred to in section 3.3 of this consolidated impact assessment. These benefits have not been quantified here, but their occurrence supports further the choice of option 3a) as the one providing the highest health benefits. A summary of the options regarding the health benefits, economic costs and effectiveness considerations is given in the table below. Although an improvement in terms of children's health will follow from the implementation of the TSD (compared to the old TSD), children will continue to be exposed to an amount of lead scientifically proven to be harmful. Since the current limits already entered into force in 2013, the industry would incur no additional costs. There is a danger of possible fragmentation of the toys market in the Arts & Crafts area, due to some Member States establishing national limits according to the latest scientific findings. This option would assure the highest level of health protection of children in the EU. Although most toy producers would be unaffected, this option would entail some adaptation costs for the affected Arts & Crafts producers. The most positive balance of health benefits and negative economic impacts. The complete alignment of the lead limits with the latest scientific findings would prevent Member States from taking individual actions which might potentially lead to market fragmentation. This option would assure a high level of health protection of children in the EU. This option will entail lower costs for the affected industry than Option 3a). A similarly positive balance of health benefits and negative economic impacts as option 3a). There remains a danger of possible fragmentation of the toys market in the Arts & Crafts area, due to some Member States establishing national limits according to the latest scientific findings. No new monitoring and evaluation tools are foreseen specifically for this initiative. The TSD contains an obligation for Member States to send to the Commission a report on the application of the Directive, including its amendments. Such report has to be sent by July 2014, and every five years thereafter. It has to contain an evaluation of the situation concerning the safety of toys and of the effectiveness of the Directive, as well as a presentation of the market surveillance activities performed by each Member State. Member States will in particular report on the following indicators: number of controls performed, number of non-compliant toys found and number and nature of measures taken against economic operators. Following these reports, the Commission has to draw up and publish a summary of the national reports. These enforcement actions foreseen by the TSD will apply also to this initiative. (5) Options considered by the IASG constantly evolved through discussions. Therefore, not all external consultants had the opportunity to include all the changes of the options in their studies and assess them comprehensively. (8) http://ec.europa.eu/enterprise/sectors/toys/files/reports-and-studies/final-report-lead-in-toys-matrix-insight_en.pdf , p. 31: factor F2 which "is regulated by the migration limit set at the EU level ". 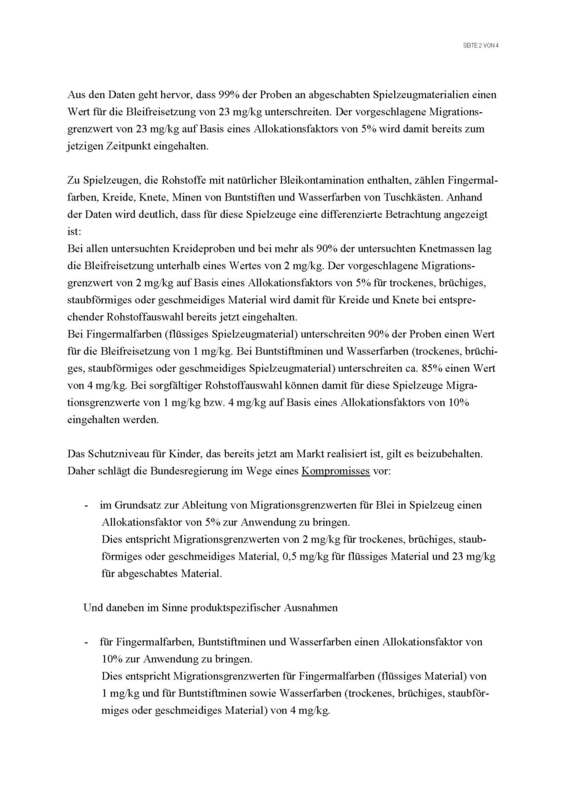 (9) German Ministry of Economic Affairs, Position paper on lead, 31 May 2013. See Annex XI to this consolidated impact assessment. (10) German Ministry of Economic Affairs, Position paper on lead, 2 October 2013. See Annex XII to this consolidated impact assessment. (11) Swedish Chemicals Agency (Kemi). Data made available in December 2013. (19) It has been estimated that for a given oral dose of lead, children absorb three times the quantity that adults absorb, and retain six times as much. Goyer, RA (1991): Toxic effects of metals. In Amdur Mo, Doull J. & Klaassen CD (Eds. ), Casarett and Doull’s Toxicology: the Basis Science of Poison, Fourth Edition. New York, NY, Pergamon Press. (21) EFSA CONTAM Panel (2013) Scientific Opinion on Lead in Food, p. 5, p. 98. (22) Polyvinyl chloride (PVC) is the third most widely produced plastic. 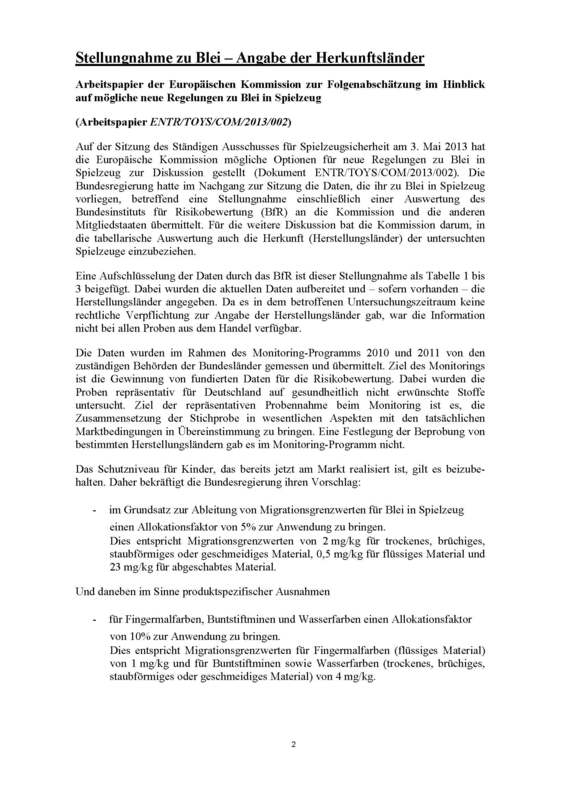 (26) German Ministry of Economic Affairs, Position paper on lead, 31 May 2013. See Annex XI. (27) Swedish Chemicals Agency (Kemi). Data made available in December 2013. (42) ECHA RAC (2013) Opinion on an Annex XV dossier proposing restrictions on lead and its compounds in articles intended for consumer use. (43) 16,011,195 million children. http://ec.europa.eu/enterprise/sectors/toys/files/reports-and-studies/final-report-lead-in-toys-matrix-insight_en.pdf . P. 46. (44) Directive 2009/48/EC on the safety of toys. OJ L 170, 30.6.2009, p. 1. (47) Recital 22 of the Toy Safety Directive 2009/48/EC. OJ L 170, 30.6.2009, p. 1. (49) SCHER (2011) Opinion on a Lead Standard in Drinking Water. – The opinion is largely based on the EFSA CONTAM Panel (2010) opinion, replaced by the Panel's opinion of 2013 (see footnote above). (50) EFSA CONTAM Panel (2013) Scientific Opinion on Lead in Food, p. 5, p. 98. (51) Recital 22 of the TSD. (53) Scientific Committee on Health and Environmental Risks (SCHER), Opinion on the "Evaluation of the Migration Limits for Chemical Elements in Toys", adopted on 1 July 2010. (54) TSD Annex II, Part III, point 13. (55) National Institute for Public Health and the Environment (RIVM), Chemicals in Toys - A general methodology for assessment of chemical safety of toys with a focus on elements. RIVM report 320003001/2008. Table 8-1 TDIs and sensitising potential for the different elements (p. 114) and tables 8-2, 8-3 and 8-4 (pp. 120 – 122). (56) EN 71-9:2005+A1, Annex A, section A.10. (57) EN 71-3:2013, Table E.5. (58) German Ministry of Economic Affairs, Position paper on lead, 31 May 2013. See Annex XI. (59) German Ministry of Economic Affairs, Position paper on lead, 2 October 2013. See Annex XIII. (60) 10% would still be in line with the opinion of SCHER (2010) Opinion on the "Evaluation of the Migration Limits for Chemical Elements in Toys", adopted on 1 July 2010. See footnote above. (61) Swedish Chemicals Agency (Kemi). Data made available in December 2013. (62) The quality-adjusted life year (QALY) is a measure of disease burden, including both the quality and the quantity of life lived. (63) http://ec.europa.eu/enterprise/sectors/toys/files/reports-and-studies/final-report-lead-in-toys-ecorys_en.pdf . P. 69. (64) OJEU, 28.5.2011, C 159, p. 23. (71) Directive 2002/96/EC of the European Parliament and of the Council of 27 January 2003 on waste electrical and electronic equipment (WEEE). (72) Directive 2011/65/EU of the European Parliament and of the Council of 8 June 2011 on the restriction of the use of certain hazardous substances in electrical and electronic equipment (ROHS). (73) Directive 2008/98/EC of the European Parliament and of the Council of 19 November 2008 on waste and repealing certain Directives. (74) European Parliament and Council Directive 94/62/EC of 20 December 1994 on packaging and packaging waste. (75) Directive 2006/66/EC of the European Parliament and of the Council of 6 September 2006 on batteries and accumulators and waste batteries and accumulators and repealing Directive 91/157/EEC. (76) Regulation (EC) No 1907/2006 of the European Parliament and of the Council of 18 December 2006 concerning the Registration, Evaluation, Authorisation and Restriction of Chemicals (REACH). (77) In the last 4 years, RAPEX has only reported 64 toys infringing the migration limits set by Directive. The Joint Market Surveillance Action on TOYS coordinated by PROSAFE in 2006 shows similar results. 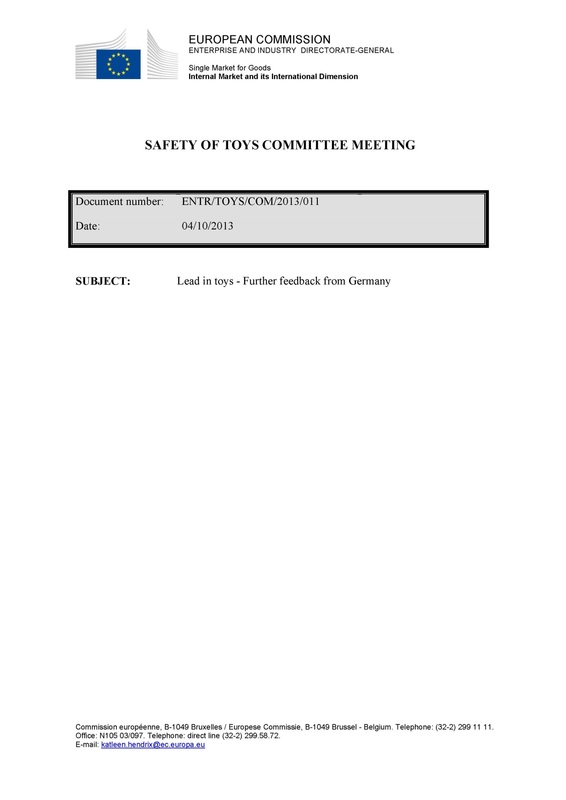 (78) The impact of the 2009 revision of the Toy Safety Directive was assessed in 2007: http://ec.europa.eu/enterprise/sectors/toys/files/toys_final_report_30_july_2007_en.pdf . The costs considered were financial costs (administrative, distributional, manufacturing and comitology costs) and other economic costs (enforcement and compliance costs and costs of delay to innovation and in authorisation). Ecorys (Annex VIII) estimated the order of magnitude of the most likely impact of the 2009 revision of the Directive on production of a loss in competitiveness on the domestic and global markets at 26 million euro. (83) It is not possible to aggregate these savings; aggregating them could lead to double counting of benefits. At the meeting of the Expert Working Group on Chemicals (8th December 2010), TIE was asked to find out more about the US views on the feasibility of lowering the US total lead limit from 300mg/kg to 100mg/kg. Please find attached a copy of the Toy Industry Association’s (TIA) submission to the Consumer Product Safety Commission (CPSC). TIE would like to take this opportunity to re-iterate that the EU toy industry association (TIE) takes the view that the existing EU approach that sets “heavy element” restrictions based upon migration should be maintained. Migration is a measure of exposure and hence measures the risk posed. Setting restrictions based upon total concentration is unscientific and deals only with the intrinsic hazard of a substance and does not directly measure risk. TIE requests that the Commission discusses this approach with all Member States and stakeholders and verify whether it is scientifically valid because it will result in the banning of important toy types such as finger paints, paints, crayons, inks etc. Such toys would be banned because certain raw materials cannot be obtained in a sufficiently pure state owing to naturally occurring background traces of lead. TIE has consulted with members on the impact of the revised lead limits and the wider effects are summarized below. Ban of liquid toys such as liquid paints, poster paints, finger paints, crayons. A 0.5mg/kg limit will mean that these toys would fail the lead migration test because critical raw materials like kaolin and titanium dioxide inevitably have naturally occurring traces of lead. For chalks, powder paints and crayons that also use the same raw materials as paints, there will be problems satisfying the proposed limit of 2 mg/kg and these toys could also be banned. Materials like the metal brass will be potentially banned from use. From EN71-3 testing data already available and information provided in the TIA submission to the CPSC, a 22mg/kg limit for scraped-off materials will be exceeded by some metal alloys that have a low level of lead such as brass. It is possible to find brass in toys in bushings, washers, screws, ferrules on tips of writing instruments etc. The use of recycled plastics and recycled metals would be risky in that it is difficult to obtain sufficiently pure raw materials that will reliably meet a 22mg/kg limit. We can conclude that the protection regime for toys is over 20 times stricter than for drinking water. Although there is not a problem detecting 0.5mg/kg lead in “clean” liquids using modern analytical equipment, the situation is different when the liquid is a paint and has to be tested using the EN71-3 migration test. As the maximum permitted limits are lowered the EN71-3 migration test method will inevitably suffer from even more inter-laboratory variation than it does at present with today’s limits. There is good evidence to show that laboratories (including Notified Bodies) are struggling to get good inter-laboratory agreement when applying EN71-3. Even lower limits will make the problem worse and give rise to legal uncertainty as to the compliance of a toy or material. Lower limits for lead will mean that analytical equipment like ICP-MS and AAS with graphite furnace will be required by test houses. This is expensive technology and not straight forward to operate, again exacerbating the issue mentioned above. 3) Factories that possess in-house laboratories will not be able to justify this level of investment in equipment and staff. In this case the monitoring they perform will be to higher limits and so offer no legal certainty of conformity. The assurance on conformity with the lower limits will have to be through a test conducted at a suitably equipped test house. It will also be the case that XRF screen testing will be less useful because it will more frequently detect lead above the lower thresholds, which will necessitate laboratory testing. This questions the usefulness of the screen test. Non-metals, surface coatings, virgin plastics and textiles, should be capable of meeting a 22mg/kg limit. In conclusion, TIE believes the approach that uses a benchmark dose level from the EFSA report on lead in foods, should be reconsidered. The very low limits for liquid toys and powder-like materials will ban toys such as finger paints, poster paints, liquid paints and powder-like materials such as powder paints, crayons and chalks. Considering that the proposed restrictions on lead are much more stringent than for lead in drinking water, TIE believes the proposed restrictions go too far and are wholly disproportionate to the implied risk. The proposal to lower the lead limit for scraped-off materials to 22mg/kg will preclude the use of some materials but the wider impact will be negligible. The manufacturers of art & craft materials and other colouring products classified as toys are deeply concerned that again a tremendous reduction in lead migration limits is discussed on a European level - especially concerning dry, brittle, pliable materials/toys and liquid materials/toys. 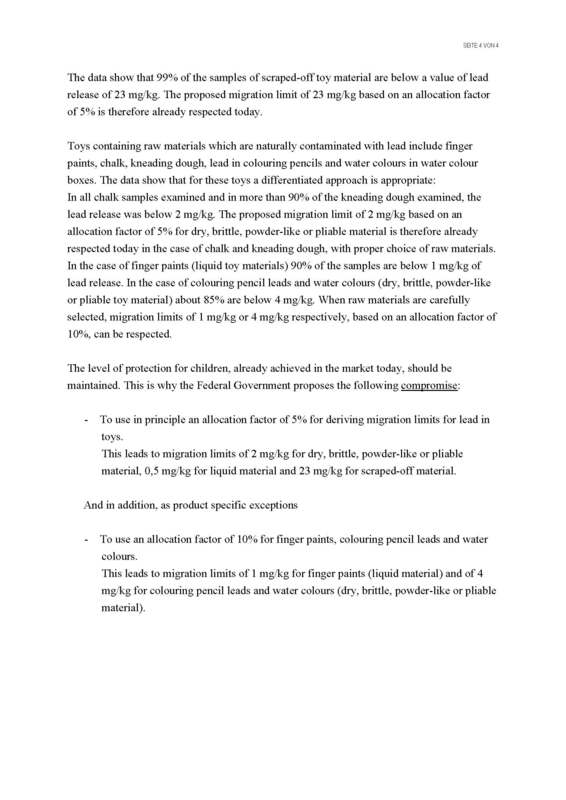 It is already a highly sophisticated task for manufacturers of the writing instruments industry to find adequate natural or man-made materials and to reformulate their products to ensure that art & craft materials and colouring products classified as toys comply with the current migration limits for lead of 13.5 mg/kg for dry, brittle or pliable materials / toys and 3.4 mg/kg for liquid materials / toys as well as with the respective migration limit of any other element. In leads of coloured pencils, solid materials intended to leave a trace (e.g. chalks, wax crayons, pastels) or in water paint tablets, extenders are necessary for physical and mechanical properties, e.g. stability, breaking resistance and smooth abrasion without scrapping (up to 80% of a lead/solid painting media). Extenders are also used in viscous paints, e.g. finger paints (EN 71-7, Annex C). Consistently in the whole industry, Kaolin (synonym: china clay, porcelain clay) - a natural product - is used as extender. Alternative materials are also from natural sources, e.g. chalkstone, talc or other grinded rock materials. Several quality levels of Kaolin for industrial or consumer products from different mining resorts all over the world are available on the market. Simple technical Kaolin qualities are not suitable for a use in toys (total lead content up to 4000 mg/kg), because the toys would not comply with legal requirements in Europe or in the US. Due to the natural variability in lead content from a natural material, suppliers refrain from providing confirmation / certification concerning total lead limits or migration limits. Dedicated qualities of Kaolin used in toys ranges between 70 mg/kg and 100 mg/kg lead. The lead content of Kaolin ("good quality") is in a range of 40 - 50 mg/kg lead. The lead content of Kaolin, marketed as "low in lead" or "very low in lead" is described as < 25 mg/kg. Other suitable materials from natural sources, e.g. processed titanium dioxide (e.g. total lead content 60 mg/kg) or iron oxide - a widespread used pigment - are also containing lead. It is likely that a substantial "dilution effect" concerning lead can not be expected due to the high amounts of extenders and pigments in the products. Due to third party / notified body certificates for materials or finished products, lead migration is often described as <2 mg/kg or < 5 mg/kg (according to EN 71-3). However, results based on the detection limits of current analytical methods are neither helpful for a manufacturer's assessment concerning marketability of his product nor it is helpful for the current discussion. 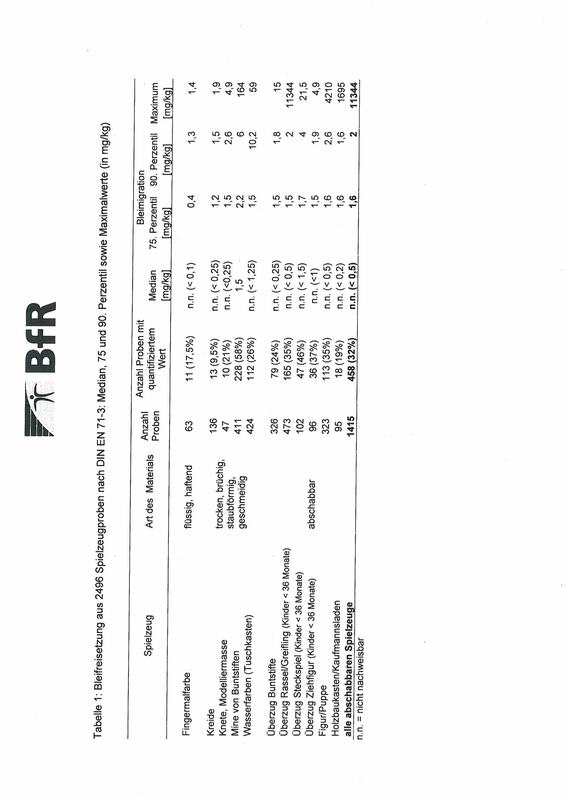 Current studies of writing instruments manufacturers on lead migration from several qualities of Kaolin used in toys result in 2 mg/kg lead to 16 mg/kg lead (see Table, p3). Thereby not only the element content vary from batch to batch, also element's migration oscillate in a considerable range. A correlation between total lead content and lead migration can not be made. Natural material "low" or "very low" in lead do not necessarily lead to low or very low lead migration! Migration of lead from a common talc is analysed to be 3 mg/kg. Considering the analytical results, art & craft materials as well as colouring products are invariably unable to comply with the planned lead migration limits for dry, brittle or pliable materials of 2 mg/kg or the planned limits for liquid materials of 0.5 mg/kg. As already mentioned in earlier statements of EWIMA (European Writing Instruments Manufacturers Association), exposition of certain elements including lead derive from natural sources in considerable amounts, due to their natural widespread occurrence on earth. The natural "contamination" of materials or substances like kaolin from natural sources is technically unavoidable. Referring to art & craft materials and other colouring products, alternative materials without lead content are not available since they are also from natural sources. Up-dated or innovative technical processes solving the problems are not technically feasible in the medium term. 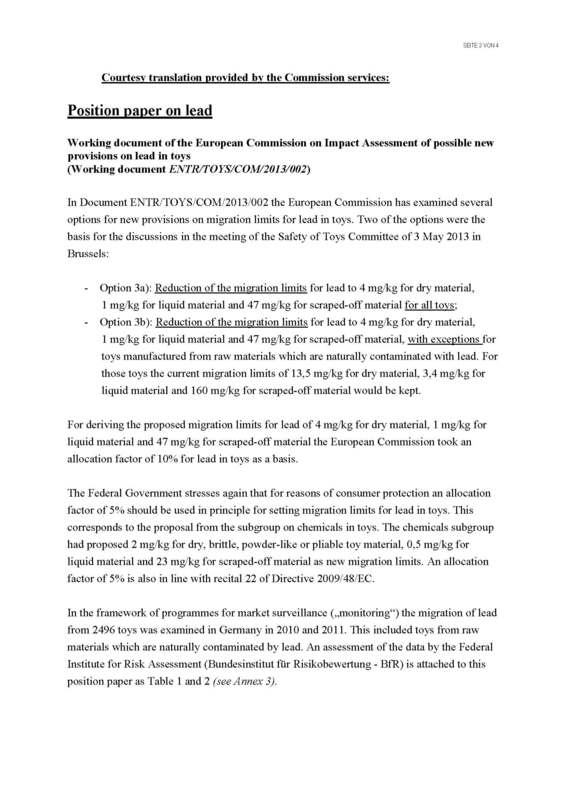 The writing instruments manufacturers realize much to their surprise that the planned migration limits for liquid materials (when measured directly in the liquid) are at a similar level as lead contamination in foodstuff (see European Regulation (EC) No. 1881/2006). A comparison of art & craft materials or other colouring products classified as toys with foodstuff in terms of risk exposure seems to be inadequate! Art & craft materials and other colouring products classified as toys are not intended to be regularly consumed. They are neither foodstuff, nor does any information point on a numerous accidental consumption of such products by children. The proposed restrictive migration limit is unjustified regarding intended use and foreseeable exposure of children. An explicit accidental consumption would be attributed to the same level as a long life daily consumption by the diet. With respect to the proposed threshold limit values for lead, the manufacturers expect a massive, very likely restrictive impact on art & craft materials and colouring products currently classified as toys which are established in the market. As the proposed limits could not be matched for the foreseeable future, these well-established products stand no chance to be marketed as toys any longer. The European Commission is currently discussing a revision of the limit values for lead in toys. With regard to drawing material, four options are under consideration: 1) no policy change, 2) a self regulatory approach, 3) a partial revision of current limit values which would exempt lead containing raw materials (clay, kaolin or pigments) used in coloured pencils, chalks, wax crayons, pastels or in water paint tablets and 4) a complete revision of current limits reducing the limits for lead in all categories of toys and toy materials. The Commission is arguing that option 4 which is most feasible for children's health would lead to a ban of coloured pencils, chalks, wax crayons, pastels or in water paint tablets as they cannot meet higher standards. The industry is claiming more stringent lead values for dry, brittle, pliable materials and for liquid materials will make disappear many drawing materials from the market. In spring, the Commission carried out a public consultation which was only addressed to economic operators1. In parallel, the Commission is looking into the health related effects. In this position paper, ANEC and BEUC reply to an invitation from the Commission to contribute our views primarily with regard to the specific sub-question of lead exposure stemming from drawing materials such as coloured crayons. ANEC and BEUC criticized for many years that the limit values for heavy metals including for lead in the Toy Safety Directive are inappropriate to protect the safety of consumers. As lead is toxic, and children are exposed to it through various channels such as the inhalation and ingestion through food and drinking water but also toys, minimizing exposure to levels as low as reasonably achievable (ALARA principle) is urgently needed. The European Food Safety Agency has pointed out that the current TDI is inadequate as exposure of children to lead through food consumption is already too high to exclude negative health effects. Moreover, EFSA pointed out that it is not possible to establish a safe limit value for lead for the critical endpoints such as neurotoxicity and the endocrine system. Hence, a TWI (Tolerable Weekly Intake) or a TDI (Tolerable Daily Intake) cannot be set. To protect better children's health, we call for a massive reduction of current limit values by a factor of 7 based on a 5% allocation2. Coloured pencils, wax crayons and other drawing materials can play an important role for the development of children's creativity. Therefore we are, of course, in favour of ensuring that those articles can be made available to children also in future presumed they can be made in such a way that they do not jeopardize children's health. A general exemption of drawing material from lower lead levels for toys is not the right way forward. If they cannot be made safe, it could also mean that they ultimately need to be banned. We doubt based on manufacturer's replies and on product test results from our member organisations that all those drawing materials would disappear from the market as they would be unable to meet stringent threshold limits for lead. Just half of the respondents (43) to the public consultation consider that certain toys have to be banned whilst 33 do not know and 5 do not expect this would be needed. Furthermore, the results of the Commission public consultation shows that many manufacturers do use raw materials containing lead (39), little less manufacturers (28) do not make use of such raw materials and a considerable number of respondents does not know (14) if lead is present. This finding can be confirmed by several tests on toys of ANEC and/ or BEUC member organizations that have been carried out in recent years. In all tests there are toys with large differences concerning the content and release of hazardous chemicals including on lead3. Manufacturers who claim that they cannot produce lead free drawing materials should make relevant information available e.g. to the sub-working group on chemicals in toys for an in- depth discussion and consideration. Likewise, information should be made available to stakeholder concerning the possible economic impacts and development of prices for consumers. The public consultation of economic operators does not give a clear picture. Although a majority (63 out of 81) expect an increase in costs, 8 expect no increase in costs and 10 respondents do not know. We recommend that the Commission carries out an independent assessment of the situation and not only to rely on claims of manufacturers. While we see drawing materials to be important for the development of children's creativity and therefore should also be available in the future, safety cannot be compromised and in case those items cannot be made safe, they ultimately might need to be taken off the market. Favour option 4, i.e. carry out a complete revision of current limits reducing the limits for lead in all categories of toys and toy materials. Carry out an independent assessment of the situation as we cannot rely on the accuracy of manufacturer's replies to a public consultation when deciding on the level of safety for children. ANEC and BEUC call for a massive reduction of current limit values of lead by a factor of 7 based on a 5% allocation. The Swiss FRC tested in 2011 carnival make-up for children including coloured crayons. Some of the products were free of lead and one contained up to 3.8 mg/kg lead. German Stiftung Warentest tested colouring pencils, wax crayons and other drawing materials with regard to the release of heavy metals. No pencil contained lead in core and lacquer (threshold 10 mg/kg Pb). With regard to water paint tablets, 10 out of 11 contained no lead but one contained 270mg/kg Pb. 3.3 Sensitivity analysis: Percentage decrease in earnings for a 1 unit decrease in IQ , and Change in IQ due to Policy Options. Table 35 Sensitivity analysis: Percentage decrease in earnings for a 1 unit decrease in IQ , and Change in IQ due to Policy Options. Reviewing the financial assumptions (e.g. discount rates) and adjusting the prices used in the study for monetization proposes to the 2012 prices. The prices included in the study were the 2007 prices and therefore needed to be adjusted. Providing a sensitivity analysis for changes in the prevalence rate with regard to ADHD and IQ. The critical parameters for the financial analysis are the incidence rates and the prices assumed for the medical costs and productivity losses of mothers, children and adults. 14,377 million euros for Policy Option2, equivalent to a per capita benefit per child of 884 euros. The changes in prevalence of ADHD of 0.02282%, at a 55% probability of continuing ADHD throughout the adulthood (as assumed by the Matrix Study), will generate a benefit of 757 million euros. A change in IQ from 0.0970 to 0.1020 due to Policy options 1 and 2, assuming a 2% decrease in earnings for every one unit decrease in IQ would lead to benefits between 14.4 billion euros to 15.1 billion euros. even minor changes in IQ (0.0170) and even if we consider only a 0,80% decline in earnings due to a decrease in IQ it would still deliver significant returns in the scale of 1 billion Euros. The IA support study considers a discount rate of 3.5%, while de IA guidelines recommend the use of a 4% discount rate which, will from this point of view reduce the overall size of the estimated benefits. We have maintained the inflation rate of 2,7% as proposed by the study for the period 2012 onwards. We have maintained all the assumptions presented in the study concerning the average prevalence, a risk of prevalence, and unit prevalence of ADHD change per 0.01 change in ug/dl (for > 1.3 ug/dl), which is the result of the use of the US EPA Integrated Exposure Uptake BioKinetic (IEUBK) model and amounts to 0.02282%. As a next step we will present and demonstrate the cost associated with the illness and the underlining cash flows to measure the total costs for the society of the changes in prevalence. After obtaining those data we will be able to present the simulation of the impact on costs depending on the changes in the ADHD prevalence rates. The annual treatment cost of ADHD in euros at 2012 price levels is estimated to be of 1 758 per year. Considering a period of 62 year of average, the estimated lifetime treatment costs of ADHD for each child would be in the range of 76 963 euros (using as explained above a 4% discount rate and an inflation rate of 2.7%). After adjusting the 2007 reference value of annual treatment cost of a mother caring for a child with ADHD of 832 euros per year to 2012 prices and considering a care period of 15 years, we arrive at a lifetime treatment costs of mother caring for child with ADHD of 15 918 euros per child. Annual productivity loss of a mother caring for a child with ADHD was estimated in 2007 at 1 932 euros which at 2012 prices represent an estimated loss of productivity amounting to 2 534 euros and during a 15 years period will represent a total loss of 36.963 euros per child. The estimated value of the productivity loss of an adult ADHD patient is estimated to be of 26 229 euros at 2012 prices. 14 377 million euros for Policy Option2, equivalent to a per capita benefit per child of 884 euros. The table below shows the different benefits resulting from changes in prevalence of ADHD. As mentioned in 2.2, the unit prevalence of ADHD change per 0.01 change in ug/dl (for > 1.3 ug/dl) was of 0.02282%. The table below allows us to quantify the economic impact of such a change. At a 55% probability rate (the one assumed in the Matrix Study), the expected benefit of such a reduction in prevalence would be 757 million euros (see the highlighted raw). Thus the table provides the monetization of benefits for a very large range depending on changes in prevalence. It shows for instance that the value of preventing 1 626 children from acquiring ADHD would have an impact to the society of at least 321 million euros. In the next section we will present the expect results of the benefits resulting from changes in these parameters. 3.3 Sensitivity analysis: Percentage decrease in earnings for a 1 unit decrease in IQ, and change in IQ due different policy options. The table below presents the quantification of the total benefits of preventing a reduction in IQ. A change in IQ from 0.0970 to 0.1020 due to policy options PO1 or PO2, assuming a 2% decrease in earnings for a 1 unit decrease in IQ, would lead to benefits between 14.4 billion euros and 15.1 billion euros. However the table demonstrates that even minor changes in IQ (e.g. 0.0170) and only a minor decline in earnings resulting from the IQ decrease (e.g. 0,80%) will result in significant returns in the scale of 1 billion Euros. Table 05 Sensitivity analysis: Percentage decrease in earnings for a 1 unit decrease in IQ, and Change in IQ due to Policy Options. During the public consultation, the online questionnaire, hosted on the EU's website, was opened to all categories of economic operators involved in toy manufacturing and marketing. Information on the public consultation was promoted thought different business networks, e.g. Enterprise Europe Network and Toy Industry of Europe. Of the 81 replies received, 56 were submitted by SMEs, representing 70% of the respondents. The impacts on SMEs were not measures specifically in each of the options presented. This is because SMEs represents the majority in the toy sector. Statistics shows that of the 2000 companies involved in toy manufacturing and marketing in the EU, most of them are SMEs. Costs on SMEs are expected to be higher than the costs on larger toy manufacturers. However, given the health risks and the range of health costs, they appear as proportionate in relation to the benefits to be obtained. At the end of the impact assessment, there was no indication of a disproportionate burden on SMEs. On the contrary, mitigating measures for SMEs, such as exemptions or longer transitional periods, would have undermined the objectives of the initiative, because SMEs are predominant in the toy sector.